As a local business, we support our neighbouring communities in partnering with many businesses to promote the importance of Secure Document Destruction and the awareness and prevention of Identity Theft in their community. 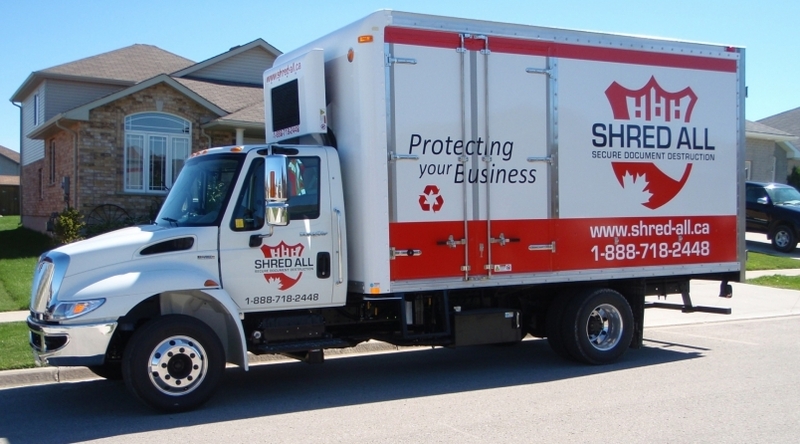 For a fee of $250.00, we will provide our shredding truck for two hours for on-site shredding at your event. Though large, our trucks have a limited capacity, so shredding is provided to your target audience on a first-come, first-served basis. We limit 6 boxes per person. Your organization will provide volunteers to interact with the public, provide crowd flow, greeting of participants, wheeling the shredding carts to customers to fill and bring back to the truck for shredding. If your organization wants to accept donations as a fundraiser for a charity, all monetary transactions with the public are exclusively handled by your organization. Similarly, should you have the capacity to issue tax receipts for donations, that process is handled solely by your organization. As the host, you are also responsible for proactively advertising your event, and must include reference to the participation of Shred All offering their services. We thank everyone who has contacted us about participating in our Community Shredding events.